I am a collector. I love art objects. I love books. I love curiosities. I love vintage photos. 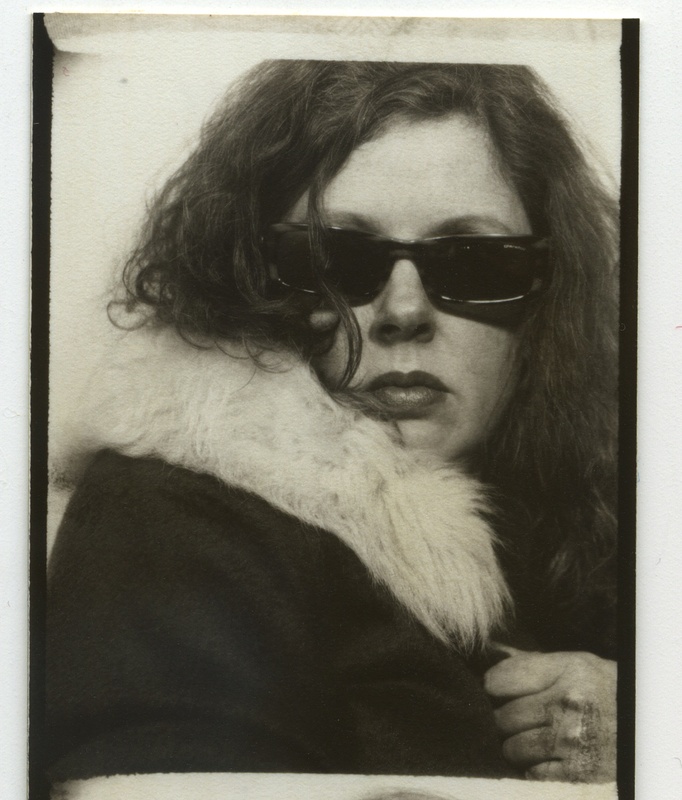 This blog documents my main photographic passion, photobooth photos. My collection includes photos of myself, friends and family. I also have a growing collection of found photos and older examples of booth pics that I have bought on-line and in junk shops around the world. In August of 2013, after many years of unexplained, serious health issues, I was diagnosed with a genetic condition called Ehlers Danlos Syndrome (EDS) which is also known as Joint Hypermobility Syndrome (JHS). It is the cause of my ME/CFS symptoms, so my previous diagnosis still stands : I now have a clearer idea of why I am so unwell. EDS/JHS is a hereditary connective tissue disorder that is caused by a defect in the structure, production, or processing of collagen or proteins that interact with collagen. Collagen is an important contributor to the physical strength of skin, joints, muscles, ligaments, blood vessels and visceral organs; abnormal collagen renders these structures more elastic. This leads to many and various digestive, pain, blood pressure, adrenaline and fatigue related symptoms that are extremely unpleasant and debilitating. As my everyday activities and social life are limited by my illness, I started this blog as a creative outlet and a means of maintaining contact with the outside world. Comments and questions are very welcome. I always do my best to respond to my readers quickly but sometimes it may take a little longer than I would ideally like. Eventually I will get back to everyone, I hope. For anyone who is interested in learning more about Ehlers Danlos Syndrome, you can click here to go to this informative UK based website. Hi Sue, Thanks for the comment. Yes, that is how I found you through the Spicks and Specks tag. It is also funny that I assumed you were a man from your art work! Looking forward to seeing more of your art. Thank you for the follow and for the kind comments. Your own project sounds fascinating and I look forward to further blogs. Am very sorry to hear of your condition. I’ve had a similar post-viral condition myself and it’s hard to have to manage your life, instead of just being able to live it freely. Good luck with coping with that and with your project. PS You look very stylish in your photo! I am sorry to hear that you have also had health troubles. I hope it has completely cleared up. I guess my artwork isn’t exactly dainty. I never would have dreamt that it wasn’t obvious so it was an interesting observation. I rarely sign my artwork and usually put my initial and surname so I now wonder if others see my work that way too. Cheers Ms Sue. Could be good for your sales, Sue! I think there is still a distinct prejudice against female made art in the art and popular press. Katherine, I collect photo booth photos too!!! In fact, I had my own pictures taken in a photo booth just yesterday. Some of them appear on my tumblr page which you can find through my blog. I look forward to seeing this blog grow and prosper. If I didn’t have most of my stuff in storage, i’d scan some of my vintage bathing suit photos to send to you. I have a small series from Argentina, all taken by itinerant photographers in the 30s and 40s. Need days to explore all your wonderful collections! Must go back to sleep now. What a great idea to chronicle photobooth photos. I enjoyed browsing through your works. Great idea for a blog. I’ve just stumbled across your blog. Brilliant! It’s taken me straight back to the 70’s and cramming into photo booths with school friends. Glad you found me. Welcome Ziggy! Will check your blog, too. Hi Katherine, I am sorry to hear about your serious health condition. I am sending you positive healing thoughts and prayers. I too have a real draw to photo booth pictures. I have started a photo booth scrapbook of my own. Whenever I see a photo booth I take the opportunity to grab a friend and jump it. I have some old photo booth pictures from when I was a kid too. I also have some old photos from the 1930’s of family members taken in photo booths. What a fun thing to collect. I would share some with you if you would like. I am in Michigan, USA. Thanks for you kind sentiments re my health, too. Wonderful blog Katherine, I’m fascinated by photobooths and think your blog is great. ps I also have ME so I appreciate how poorly the condition can make you feel. Wow, you poor thing. Really? What a coincidence. How long have you had it? I had a formal diagnosis about 5 years ago although I have been living with it for almost 15 years. You said you were diagnosed last year but how long have you had it? Thanks Richard. I like yours a lot too. You probably all ready have it but Babbette Hine’s photobooth book is beautiful (isbn 978-1568983813) it includes a history of the photobooth followed by the photos themselves. Thanks Richard. I do have it and many others. I also collect books about photobooth photos and have 12 or so. Surprisingly, I have barely scratched the surface. I just stumbled accross your blog – really inspiring, great theme. Love it! Thanks in advance & all the best to you. I am wishing you all the best with regards to your illness. Sorry about that. I did take a look at photobooth.net, that’s a real good resource! Thought I subscribed already… I grabbed your RSS-feed now for further posts, looking forward! Thanks for the kind thoughts and enthusiasm, Henning. i too was at the 67 Expo in Montreal. What is the site. I would love to check it out. Hi Nancy. Yes, I thought that too but it is a ping-back from a reblog and it is referring to my blog. I’d also love to see a blog devoted to Expo 67 photobooth photos! What a great IDEA 🙂 great blog too!!! Thanks. I like yours, too. Make sure that book gets published – these are fascinating! Thanks for the likes and comments. Following. Thanks so much but I am only publishing online for now. A book would be nice though, of course. Your photos are so wonderful I was thinking a book should be where you are headed too! Thank you – not sure my themeless approach would work as a book but I might give it a go one day! Your images have real human interest and a very coherent theme – it must be worth a try. I’d buy it! Thanks Rob. I am often blown away by the talent I see in other people’s blogs. Your work and that of Ehpem (anonymous author’s tag name ) at http://burntembers.wordpress.com are two of great merit that spring to mind. You should be thinking in terms of a book! Thanks Jean. I appreciate the kind thought. Hello Photobooth Journal! I really enjoy your blog and so I have nominated you for a Liebster Award. Check out my blog to play along and pay it forward if you so choose! Cheers! Thanks so much for the compliment Kimberley! Katherine Anne Griffiths, you have a very beautiful blog! Jack Brewis, I am inordinately chuffed by your compliment. Thank you. I’m off to check you out. I really love the idea of your blog. Thank you very much for my first ever like and follow. You were hard to find, but I was determined! Good luck with the blog. I look forward to reading more. Thanks Super Kat. I am so glad you feel that way! It is wonderful Carl! Thank you for thinking of me. Thanks Owyn. I did check out your blog. I loved your virtual robot! Thanks for all the “Likes” of yesterday. Your welcome, and thanks again! Thank you. I kinda miss me (the old me) as well. Not very well at the moment, unfortunately. Katherine, I’m so glad you dropped in on my blog. I enjoyed my perusal of your photos. I hope we’ll keep in touch. Take good care. I live near Toronto, Ontario in Canada. It is exciting, isn’t it, how the web can make these exchanges of ideas possible?! Thanks Gwen. I love the web, too. I am a big fan of Canada. A friend I studied with many years ago lives in Toronto. I was lucky enough to be able to visit her there at one point. Such a lovely city. I felt immediately at home. Trying my best to be well but doctors like to experiment on me at times. Recently has had negative consequences for me. Good in spirit though and glad to have found you and your fabulous photo blog. One day I will get to a convention, I hope. PS I did live in Arizona for 2 months so some of your landscapes have a familiar feel to them. wow, isn’t Arizona fabulous! I was first there in 1977 as a junior in high school (living in Michigan) with my father as a helping hand when we raced 1/4 mile drag boats on Firebird Lake in Phoenix. And thank you so much for the wonderful appreciation Katherine. Now I will think of you when capturing in and around the valley. I so love to see new posts from you. Always so interesting and fascinating. Be well my friend! Agreed about AZ and thanks for good wishes, John! very courageous and strong. It shines through!! Thanks. That is a very sweet comment! what a great photo-booth journal, especially the old photo-weigh pictures from the 30’s I like most. I’m a collector of weighing-machines for more than 40 years. I already got more than 10 photo-weigh-Pictures form UK, Germany and France (Moulin Rouge). Up to now I’ve never seen a Photo-Weigh-Booth, I’m still looking for it even a Photo or a Picture is helpfull. Is there an existing Photo-Weigh-Booth anywhere in Europe? Do you have any further information about these combined machines Weighing-machine and Photobooth? If you like, I will send my little collection of Photo-Weigh-Pictures to you via email. Good for Ted and thank you for the attention!, I’m sorry to hear you have a cousin with EDS. as an inherited disorder, I am guessing others in your family are affected? Unfortunately if effects my blood pressure so badly that I am limited a lot in what I can do. Now having an iPad, I can blog lying down! That helps a lot! because I really appreciate your posts and they mean a lot of inspiration to me, I would like to nominate you for the INFINITY DREAM AWARD. Thanks Markus! I will look into it! I don’t want to burden you all that questions and tasks. Important for me is to say that I like your blog and the idea and all the dreams in it. Thanks Rob. I look forward to seeing more of it. Hey! I am intrigued, amused and fascinated by your photobooth obsession, and i love it. What an excellent thing to do. I wish i had some to send you, but sadly…. Now, which part of Leicestershire did you live in? I was in Quorn for ten, or was it eleven years, worked at the Leicester Royal Infirmary. Interesting to read about the EDS. maybe one day we will talk about all this together. Hi Tony, Thanks for your message. I guessed you were a doctor due to your xray pics. I love your obsession, too! I lived in South Knighton and worked in Shepshed, so not that far from where you lived, I’d guess. If you have any ideas about EDS I’d love to chat! I just found your blog via a comment you left on Hero Culte, and am so glad I did as it’s wonderful. I was quite surprised to click your About page and find someone who, like me, is an Australian with the combination of ME/CFS and hypermobility. I’m also blogging for the same reasons as you, to have an outlet and a line to the ‘outside world’. If you ever want to chat, feel free to email me. Meanwhile, I will be adding you to my blog links :). Thanks for getting in touch. I’m glad you like my blog! Yes, it is very surprising we both have the same dreaded combination of illnesses. It would be great to chat sometime. I am off for my first weekend away in three years, so maybe when I get back? That is, if I haven’t completely collapsed by then! Hi Kate. Thanks for your kind words about my blog. Yes and no to being too ill to do it for that time. It certainly made it take longer for me to get back to it than I wanted. Yep, yé-yé is early-to-mid 60s French pop/rock. Spain also adopted the term after the French and that’s why you get a song like ‘Chica ye-ye’. I was hoping the link would be to ‘Jaan Pehechaan Ho’ – my favourite too! (Thank you, Ghost World). So lovely to stumble upon you in my search for avid photoboothers. I hear they are taking the last remaining booth from Flinders St Station this Sunday!!! What can we do???? I do hope it is going to a good home! Where did you hear that? I’m in shock as I have a visit planned for Monday! Arrrgh! Thanks for commenting and for letting me know. Must say I’m enjoying your site. You have no contact page though. Bah. Congratulations on a Brilliant Blog. I run a website for local and family historians about photographers in Cambridgeshire in the UK from 1840-2000. I’ve picked up a bit on photobooths along the lines of identifying and dating small portraits people find amongst their family pictures.I wondered if you had come across anyone who has produced any information relating print sizes to particular types of photobooths. For example I have some UK images datind from 1929 (give or take a year) which are in a strip 45mm wide. I’m wondering if these are from a photomaton machine. I’ve other images on a strip 37mm wide, and others 40mm wide- in the last case the rear of the strip is badged “PMI” which I think must make them from a Photo-Me International booth. I’d very much like to build on this more techie info if you or any of your readers are into this side of photobooth image collection. I’m so sorry I didn’t find this comment until now. I’ve been very unwell this year an dthings have gotten away from me. The best person to contact about technical issues I think might be Meags Fitzgerald in Canada. I will see if I can find her contact details. Twitter might be your best bet. Yes. She is on Twitter @meagsfitzgerald/. I think that would be your best bet I feel you still need the technical information. I will check out your website now. Best wishes, Kate. We will have an article about a couple finding the perfect match and we would like to show Photobooth images. My question is, could you license some images for me? I sent you an email as soon as I received your comment. Did you receive it? I seem to be having trouble with my email account but only with International messages, it seems. Please let me know and I will resend from another account. My sister lives in Dublin. She sought out the last known photobooth location but found nothing there. To my knowledge there are only digital booths left there. Good luck with you photobooth travels. Do you know the booth finder on photobooth.net/? Yes, they are both still there. If you get some photos you are happy with, I’d love to share them on my blog if that was of interest to you? In the meantime, happy New Year and thanks for visiting! Glad you found that post! I hope to hear from you again. Une grande imagination et une grande créativité. Merci Sylvain. Cela me fait plaisir de collectionner et d’écrire sur ces photos. Je suis encore plus heureux que les lecteurs, comme vous, apprécient mon blog! Hi Katherine, I admire your work here, the amount of time and effort you put into these collections. I’ve only scratched the surface but will be back to peruse some more. I hope your health improves. You are certainly an interesting person. I like popping over! 🌹 The previews are tantalising and there is always a surprise when the full artwork is revealed. I have read 3 books written by Dr. Kousmine and I have been applying his method for 20 years . She has treated a lot of serious diseases . it’s a really good method. I don’t know if her books are published in English, the most important are : Sauvez votre corps , Soyez bien dans votre assiette , La sclérose en plaques est guérissable . Thank you so much for these Walter. I hadn’t seen these links until you alerted me to them. I follow many of these rules for eating (apart from eating a lot of beans and pulses as I am intolerant to those ☹️. They cause me a lot of pain) and although I’ve tried, I just love my coffee so much I don’t want to give it up. Her recipes look lovely and there is always something new to be learned and tried, so I will cook one or two and see if I can some more variety to what I eat. Hi Katherine , I sent you some links in the comments on this page . Have you seen them ? In French : je voulais savoir si tu connais la méthode de la doctoresse Kousmine , elle était Suisse et elle a soigné de nombreuses maladies graves pendant sa vie de médecin . Ici en France et en Europe elle est connue , et je pense que tu ferais bien de te renseigner sur sa méthode . Mais je ne sais pas si ses livres sont traduits en Anglais . ça fait 30 ans que je m’intéresse à toutes les questions de santé et d’alimentation , et je n’ai pas trouvé de méthode plus approfondie que la sienne . Non, je n’ai jamais entendu parler d’elle. Il est admirable que vous ayez suivi son plan d’alimentation saine avec tant de diligence et que cela a si bien fonctionné pour vous. I have read a bit about her in English and some of her recipes are online in English, too. Have you seen this:http://www.bighappyfunhouse.com. And no doubt you’ve heard the Vivian Maier story – talk about found photos! Thanks for keeping touch! Hi Liz. Here is perfect and is a comfortable place to alert you to a teeny error on your welcome page. You want to say “I am drawn to the inner lives . . .” but it actually says “I am drawn the inner lives . . .”. I’m struggling with migraines at the moment but triple checked I hadn’t read it incorrectly but then again it is possible it really is right! I loved the design of the site. It looks really good! Best wishes, Katherine or Kate, if you would like. Good Lord, how many times did I proofread that?! Thank you so much for bringing the error to my attention, Kate. I appreciate it. I’m pleased. It is something I’d like people to do for me, but can be a delicate area for some. . .